Saturday October 19th 1878 I went down to Uncle Georges early this morning and went home with him. I got here in time to help with the dinner work. We made a bed for Mays cradle early in the afternoon. Hatt then went to town and I made May a [hord?] and done a lot of odd jobs. I did some mending in the evening. Sunday October 20th 1878 Mother and Rob went to town in the new phaeton today and took May with them. I got the dinner and did the work. I wrote a letter to Mollie Briggs in the afternoon and Rob and I went to the Methodist church in the evening. Win was here for supper and John Whetstone and Hatt went to church with her. 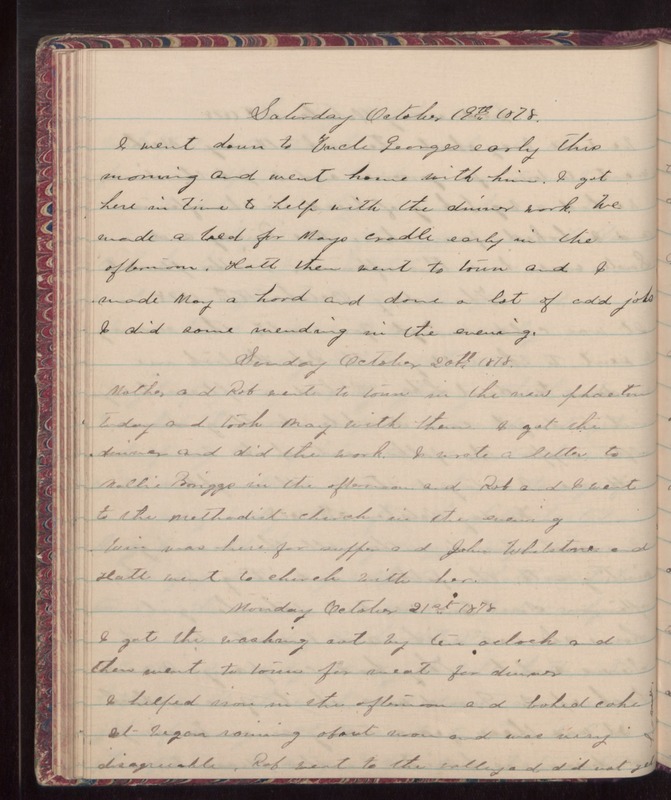 Monday October 21st 1878 I got the washing out by ten oclock and then went to town for meat for dinner. I helped some in the afternoon and baked cake. It began raining about noon and was very disagreeable. Rob went to the valley and did not get home.